Love roast chicken but hate the amount of time it takes to cook? If so, why not try spatchcocking the bird? I know, I know, it’s a funny word that always elicits giggles and comments, but what it actually is, is a cooking term for removing the backbone from the chicken and then flattening it out so that more surface area comes in contact with the heat, which greatly decreasing the cooking time. 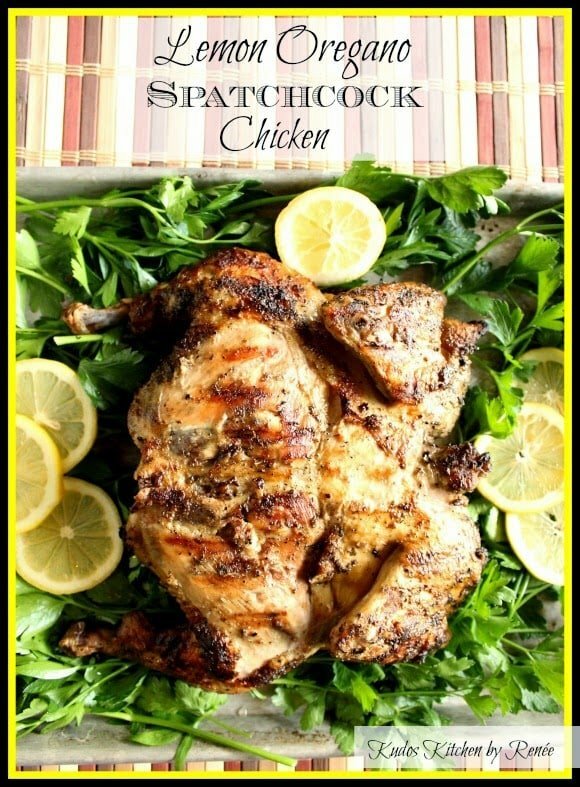 This Lemon Oregano Spatchcock Chicken for #SundaySupper Summer BBQ party is super easy to make and only requires 4 ingredients, plus a sharp pair of kitchen shears! This spatchcocked chicken can be cooked either in the oven or outside on the grill. Because this week’s #SundaySupper theme is BBQ party, I chose to cook mine out on the backyard grill. *Note – Use caution when cooking this on the grill because it’s prone to flare-ups due to the olive oil and chicken fat that will drip onto the fire. Also, because the surface space of a spatchcocked chicken is so large, be prepared with either a flat baking sheet (no sides) or a super large spatula for when it comes time to flip the chicken, if cooking it on an outdoor grill. If you’re cooking this in the oven, no need to worry about flare-ups or flipping. Just place your chicken on a rimmed baking sheet and you’re good to go! -Open the chicken flat and place on a rimmed baking sheet. -Squeeze lemon juice liberally onto both sides of the flattened chicken, along with salt and pepper to taste. 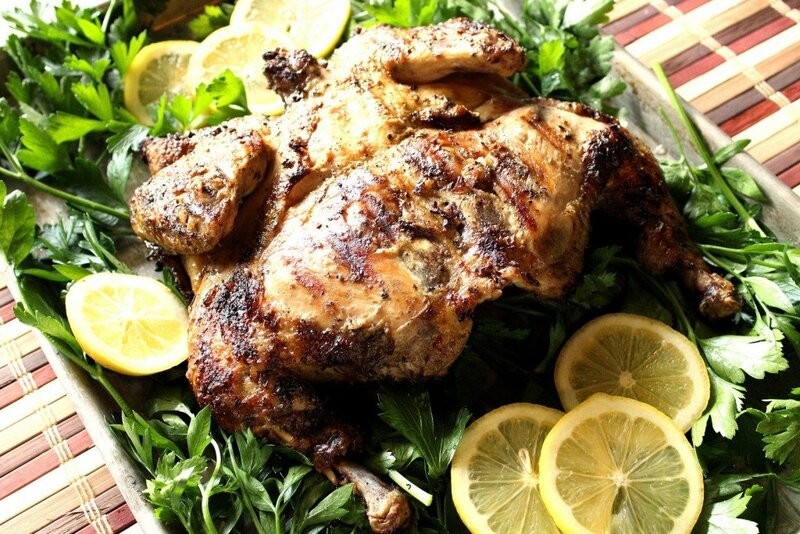 -Allow the chicken to sit for 30 minutes to marinate in the lemon juice. -Drizzle both sides of the chicken liberally with olive oil and a healthy amount of oregano. -Preheat grill to medium/high and place the bird on the grate, open side down and cover. *Note – if cooking in an oven, preheat to 375 and cook for approximately 50-60 minutes. -After about 30 minutes, flip the bird to skin side down and cook, covered for an additional 30 minutes. *Note – this is the point you’ll have to watch out for flare-ups so the bird won’t burn, So stick close and be prepared to move it around if needed. -Your chicken is done when the juices run clean and the internal temperature of the leg/thigh area is 165 degrees. *Note – If you wondering where I got that handy, dandy extra large spatula, I got it at QVC and it works like a charm for handling super large things on the grill. A special thank you goes to to this week’s #SundaySupper host, Melanie of Melanie Makes! Your are the party hostess with the mostess, Melanie! The family of #SundaySupper cooks and bakers are having a summer BBQ party and you’re invited! I sure do hope you’re hungry. Here’s our party menu, and there’s plenty for everyone!!! Oh my–this looks amazing! I have yet to spatchcock a chicken and this is inspiring me to try one soon. Especially on the grill. Thanks for the recipe. Now that's a gorgeous chicken! And here I thought it was just butterflying it. Learn something new every day! I love these flavor combinations. SO YUMMY and refreshing. Such a great flavor combination – looks amazing! I haven't spatchcocked a chicken in years, but your recipe has reminded me how much I love this preparation. Lemon and oregano are the perfect flavorings, too! I have yet to try spatchcocked chicken, but if your photos are any indication, I'm in for a treat! Funny, I've cooked a chicken this way a few times using a recipe from Cook's Illustrated, but I'd never heard of the term spatchcock until I saw your recipe. Anyway, I know how tasty a chicken is cooked this way. It cook faster, the skin is crisper and it's so juicy. Great recipe! I haven't spatchcocked a chicken yet but I now have to try this, great video too. Your chicken looks divine!! 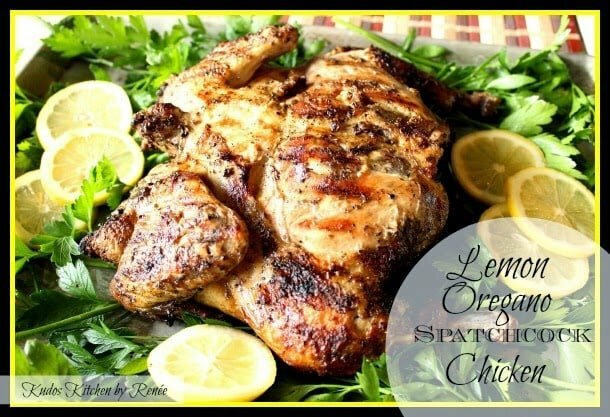 This is one of my favorite ways to prepare chicken … and lemon and oregano sounds perfect to me! Great recipe and instructional photos! Like Liz I've not done this in years, but you just reminded me how great it is! I saw someone do this a while ago and felt so inspired. I haven't yet tried it but hopefully when life calms down with work before the baby is born I will get onto it. I had never heard of the term for this until I read this post. I like to be resourceful but I don't often get this creative when I cook a whole chicken and need it done quickly since I don't like actually touching the chicken. I know,, it makes me sound like a sissy but I am still willing to give this a try! Your chicken looks gorgeous! I have yet to spatchcock a chicken, but I need to correct that soon–I can't wait to try this recipe!